Prez had praised whistleblower in 2016. 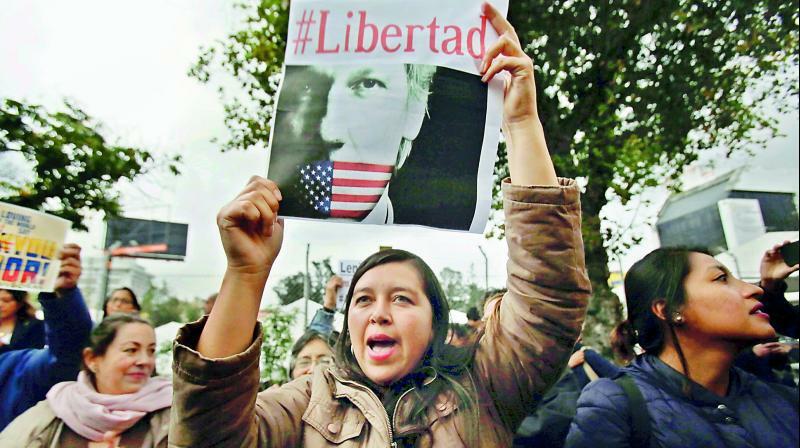 A woman holds up the Spanish hashtag #Freedom during a protest against the arrest of WikiLeaks founder Julian Assange, outside the Foreign Ministry in Quito, Ecuador. Washington: President Donald Trump declared that “I know nothing about WikiLeaks” after its disheveled founder Julian Assange was hauled out of the Ecuadorian Embassy in London to face charges, a stark contrast to how candidate Trump showered praise on Assange's hacking organization night after night during the final weeks of the 2016 presidential campaign. “It's not my deal in life.” But WikiLeaks was Trump's deal in 2016 as he welcomed the political boost his campaign got and cheered on the release of Clinton campaign emails. On the same October day that the “Access Hollywood” tape emerged, revealing that Trump had bragged in 2005 about groping women, WikiLeaks began releasing damaging emails from Hillary Clinton's campaign manager, John Podesta. Trump and his allies, facing a tough battle in the campaign's final month, seized on the illegal dumps and weaponized them. “WikiLeaks, I love WikiLeaks,” Trump said in Pennsylvania. “This WikiLeaks is like a treasure trove,” Trump said in Michigan. “Boy, I love reading WikiLeaks,” Trump said in Ohio.